I hope we get to see the caped version of Black Panther's costume at some point in the sequel to the blockbuster hit. I can't really think of a practical reason for it, but I just think it looks cool. Maybe Shuri can devise some sort of useful purpose to justify its existence. Yes! At last!! The most logical team-up none of us--for some reason--have never thought to request. The only possible way to surpass this? Have the Black Panther team up with both Batman...and Shaft-shirted, chain-belted Luke Cage. 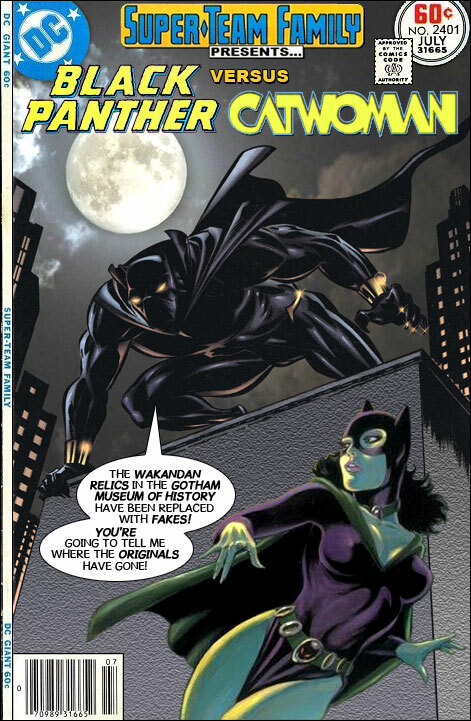 How about Black Panther vs Catman? Their costumes are actually fairly similar apart from the colors. Well, then, how about Judge Dredd vs. Deathstroke and the Kingpin? The former could be inadvertently dragged to the early 21st century as a side-effect of returning a time-traveling Jonah Hex back to the 19th! If nothing else, you'd have another interesting two-parter on your hands. Nice cover, Ross! I would have preferred to see Selina in her all-black full-coverage catsuit, but this purplish-black mini is workable. As for Black Panther's cape, it may make a brief appearance in BP2, but I don't think it'll last. "No capes" is the standard these days, thanks in no small part to Edna Mode. And now, for something completely different: Since Cary mentioned Judge Dredd, how about a cover with him vs. Pinky and the Brain? Yeah, the cape will be hard to justify. T'Challa has no secret identity worries and for any formal or "night at the opera" functions where a cape might be appropriate he will wear a tux or similar "diplomat" clothes. The Panther costume really is just a hunting / action suit. What Bob said. Failing that, however, I'd settle for P&B vs. The Zoo Crew. One use of a cape may be as a shield that he wraps around himself like a bubble. I wonder how vibranium would react with Hawkman's N-Metal. Captain America has a shield which is part vibranium was sort of hoping this would be explained by Tony's and Black Panther's fathers working together. Howard Stark and King T'chaka, as proto-Illuminati, would make for a great premise for the next MCU sequel to Iron Man. Or, better yet, BLACK PANTHER 2! The minute I posted that, I thought "crap, I'll bet it's already been done!" Sorry 'bout that! Cat-man became one of my favorite anti-heroes in the hands of Gail Simone. I think I might go and re-read her take on the Secret Six. Bobbi "Mockingbird" Morse as the head of the new Secret Six! That one is on here as well. Sorry Ross, I've always had a preference for cape-less heroes, with the only exceptions being Batman and Ragman. All other capes I've liked contained mystical properties. I concur for the most part, aside from Superman. Miss Fury and Nick Fury: Agent of S.H.I.E.L.D. The Roustabouts in: "Rule of the Ringmaster"